Harav Moshe Shapiro ZTK'L, was the Rosh Yeshiva of Yeshiva Pischei Olam in Eretz Yisroel and one of the world’s leading Baalei Mussar. His father, Rav Meir Yitzchok, was a talmid of the Alter of Slabodka and mashgiach at Yeshivas Nachlas Dovid. In his youth, he studied at Yeshivas Chevron and established a relationship at that time with the Brisker Rov, Rav Yitzchok Zev Soloveitchik zt”l. He then learned at Ponovezh Yeshiva in Bnei Brak, where he established a close kesher with the mashgiach, Rav Eliyahu Eliezer Dessler zt”l, with whom he learned bechavrusah. He also studied under the Brisker Rov’s son-in-law, Rav Yechiel Michel Feinstein zt”l. Rav Shapiro was known for his phenomenal memory. He was a boki in the seforim of the Maharal and sifrei chassidus, including the sefer Mei Hashiloach from the Izhbitzer and the seforim of Rav Tzadok Hakohein of Lublin. His shiurim and sichos displayed his wealth of knowledge in divrei Chazal, Shas and Medrash, along with sifrei Kabbolah and machshavah. Despite his greatness, he remained humble and refined, trying to escape honor and accolades while fully engaged in harbotzas Torah. His seforim, published by talmidim, include Afikei Mayim on the moadim, Mimaamakim al haTorah, Raah Emunah on the Yud Gimmel Ikrim, and other volumes. 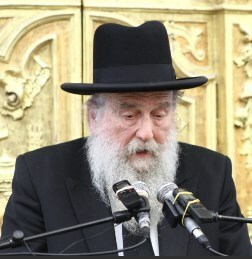 In adherence to the tzavah of Harav Moshe Shapira zt’l, setting forth a strict prohibition against the publication and distribution of his Torah without his family's consent, these shiurim are being shared with his family's consent. Without express permission, nobody is authorized to redistribute these shiurim, post them on the internet, or otherwise make them available to the public. Tizku l’mitzvos!